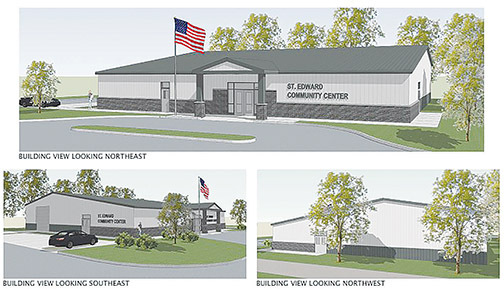 The City of St. Edward received notice on Monday that it received conditional approval of its grant request for the new community center. 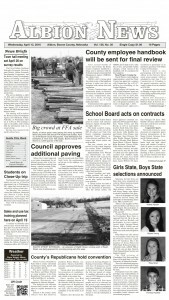 The city applied for a $562,000 grant through the Nebraska Civic and Community Center Financing Fund (NCCCFF). Department of Economic Development has $428,000 in available funds. Full grant will be awarded pending passage of an appropriation by the Nebraska Legislature. St. Edward voters passed a special one-half-cent sales tax measure in February to fund a portion of the construction cost over 20 years, and the city has purchased a lot for the new building. Additional fund-raising of about $300,000 in matching funds will be needed to finance the structure. Total building cost is estimated at $1.3 million. After passage of the sales tax measure, the city council approved the purchase of two lots for the future building site. The two lots are located across the street east of the football field, and measure approximately 133 feet by 133 feet. The council last month also adopted a resolution for the one-half cent city sales tax increase as approved by voters on Feb. 12.